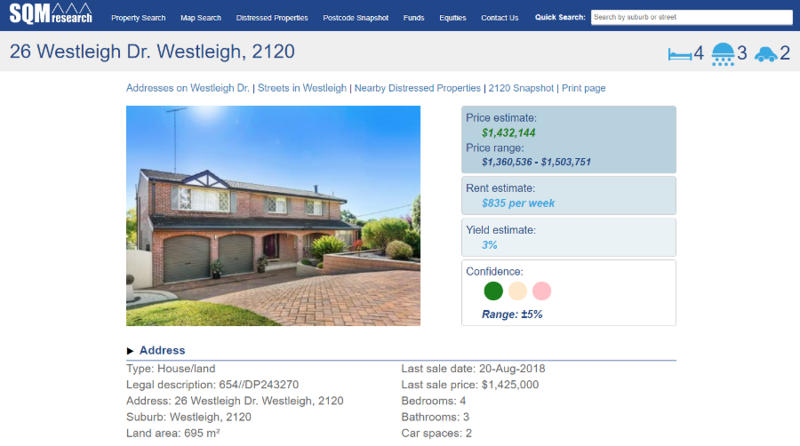 22 October 2018: Version 2.0 of the Property Valuations tool has been released. About to purchase your own home or investment property and wondering if you're paying too much? Or perhaps you've been living in the same home for a very long time and you are curious to know how much the three-bedder family house that you paid $40,000 for twenty five years ago is worth now? You may be a real estate agent who is tired of paying through the nose for residential property data programs that don’t provide accurate valuations on homes based on the current market? Or perhaps you are a financial adviser with the need for a precise tool to aid in valuing property for SMSF portfolios? If you fit into any of these profiles, SQM Research’s Desktop Home Valuation Tool is for you! Individually and interactively customized, the reports from this program generate a figure amount of a property's current worth based on a combination of specific knowledge from you the consumer about the details of the property and our own comparative sales data (sales figures of other properties in your area that have recently sold). Australia's most accurate property price estimator including estimate price, rent and gross rental yield. Provides comprehensive sales data down to a street level and stretching back up to twenty years. Not only can the user determine the current price estimate of their property but also have access to its previous sales data and can conduct historical price estimates. Provides comprehensive rental data and rent estimates. The user can determine a dollar figure of what their property could potentially be rented for. Provides our postcode snapshot report. Interactive mapping covering sold, unsold properties and current listings including days on market. Meets and exceeds the most recent valuation criteria for financial advisers wishing to estimate the value of properties within an SMSF portfolio. SQM Research provides a money back guarantee (subject to conditions) on your purchase of this product. Unlimited access to all these tools is provided under one umbrella through the SQM Research Desktop Valuation Report, and is available via monthly subscription which can be terminated at any time. Now only $99.95 per month subscription. Please note you can cancel out of your subscription anytime. SQM Research does not guarantee valuations to be produced by this tool for all properties. "Louis Christopher and the guys at SQM are my go to for independent property research and commentary. No beat up or short term hype, just a balanced view based on the facts." "Louis Christopher is one of the most knowledgeable property experts I have encountered in my long career as a finance journalist. Louis has built a unique real estate research house, SQM Research, which focuses on residential property and the performance of real estate related managed funds." "I have known the SQM Research team for some years now and have found their data and services to be reliable and trustworthy. SQM has always provided independent advice and expanded the boundaries of residential property market data."